Diarrhea of adults (new) | Infonet Biovision Home. Diarrhea of adult animals is less common than of young animals. When it occurs it can have several causes as described below. please also check these sections if relevant to your situation. Mucosal Disease is caused by the same virus which causes Bovine Viral Diarrhoea. Both are manifestations of infection by the same virus. Incidence is low but mortality is high. The virus occurs all over the world and is also widespread in Kenya. Cattle that are infected for life with Bovine Viral Diarrhoea Virus serve as a natural reservoir of virus. Virus transmission to the calf during early pregnancy results in birth of infected calves, which remain infected for life and keep excreting the virus. Fifty percent of these calves develop incurable diarrhoea when they are much older (e.g. young heifers, young steers) and die within the first two years. Surviving permanently infected calves appear stunted and are prone to respiratory and intestine ailments. Infection during later pregnancy results in abortion, calves born with congenital malformations, (eye and brain abnormalities) or birth of normal calves. Whatever the stage of pregnancy the cow herself will often be only mildly affected - she may have a raised temperature and scour for a few days but only occasionally develops a severe illness. It is the persistently infected calf which causes problems. The virus attacks all the mucosal surfaces in the body causing inflammation and ulceration and it is the results of this which cause the symptoms seen. Erosions can occur throughout the intestinal tract, lesions are seen in the mouth, nose and muzzle, there is often foul smelling diarrhoea containing shreds of intestine, mucus and blood. Occasionally diarrhoea may be so severe as to appear like water or paralysis of the gut may occur with no sign of faecal material. Other signs which may occur include discharges from the nose, excessive tears and lameness due to eruptive lesions of the interdigital cleft and coronary band. Animals are reluctant to eat and there is drooling and even frothing from the mouth. Not many animals become sick at the same time but many scouring animals die no matter what the treatment. 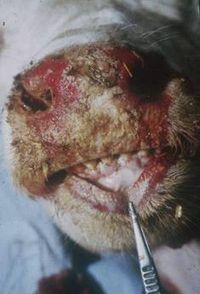 Mucosal Disease is the most severe form of BVD, where a persistently infected animal, usually under 2 years of age, is superinfected with active virus, the mortality is very high, death occurring within a few days of onset, with fever, dysenteric diarrhoea, lack of appetite, dehydration, ulceration throughout the gastro-intestinal tract and erosive lesions in the mouth and nose. Diagnosis is based on the disease history, clinical signs, gross and microscopic lesions, virus isolation from tissues such as spleen, thyroid and salivary gland and examination of paired serum samples when a more than four- fold increase in antibody titre indicates recent infection. For diagnosis serum samples have to be sent to a laboratory outside of Kenya. Cases of severe diarrhoea in young animals under the age of two years followed by their death must arouse a suspicion of BVD/ Mucosal Disease. Never let cattle graze or be together with cattle of unknown BVD status. Do not buy animals (especially not pregnant or young animals) to the herd without knowing their BVD status. Persistently infected animals should be identified and removed and isolated from the breeding herd. Only virus-negative and antibody-positive animals should be retained in the herd. Killed vaccines are safe, but booster doses are necessary to achieve a good level of protected immunity. Because the disease mainly affects cattle under 2 years and since colostral immunity from BVD positive cows wanes by 6 months of age the vaccination of young stock between 6 months and 2 years of age is a logical approach - but the manufacturer's instructions should always be followed. Vaccine is obtainable from the UK and the US. Enterotoxemia mostly affect Kids (Goats) and Lambs (Sheep). However Adult Cattle, Sheep and Goats can be affected by enterotoxemia caused by Type C.
Nairobi Sheep Disease is a tick-borne viral disease, causing a haemorrhagic gastro-enteritis (bloody diarrhea) with high fever, pulmonary oedema (lung damage), abortion and high mortality - in susceptible sheep up to 90%. Nairobi Sheep Disease occurs in Eastern Africa from Ethiopia , Somalia , through Kenya , Uganda and Tanzania , to Mozambique , Botswana and the Congo . The causal nairovirus, of the family Bunyaviridae, is probably the most deadly virus known for sheep and goats. It is identical to, or closely related to, Ganjam virus, a tick-borne infection of sheep, goats and people in India; and is serologically related to Dugbe virus, another tick-borne infection occurring in cattle in West Africa, and to Crimean-Congo Haemorrhagic Fever virus of man. Man may be infected by all of these viruses, and with the exception of Crimean-Congo Haemorrhagic Fever, which causes a severe haemorrhagic disease in man, the symptoms are those of a mild febrile illness, characterized by generalized abdominal pain, headache and backache. The principal tick vector is the Brown Ear Tick, Rhipicephalus apendiculatus, but other tick species, such as Amblyomma may also be responsible for transmitting the disease. The virus can survive for at least 18 months in unfed ticks. This means that eradication is very difficult. The virus cycles silently between indigenous sheep and goats and brown ear ticks. Clinical disease occurs when sheep and goats reared in tick-free areas are moved into tick-infested areas, or when sheep and goats from tick-infested areas enter tick-free areas while still harbouring infected ticks, which in turn feed on and infect susceptible sheep and goats. Inapparent natural infections also occur in antelopes, and there is some evidence that the peri-domestic rat of East Africa is also naturally infected. Cattle appear to be resistant. Although the antibody prevalence in man is high in Eastern and Southern Africa , clinical symptoms rarely occur. Although the virus is shed in urine and faeces, the disease is NOT spread by contact. The incubation period is about 4-5 days, followed by a fever lasting for 1-3 days. asmelly diarrhea causing painful straining. Some animals may die within 3 days. In others the disease is prolonged for 5-9 days. Animals reared in areas infested with infected ticks are usually resistant. In contrast symptoms in susceptible sheep from previously non infected areas is serious, and mortality may reach 90%. The reactions in young lambs and kids are not as severe as in adults. A natural attack gives survivors with a life-long immunity with the production of antibodies. Post-mortem reveals a severe haemorrhagic gastro-enteritis and enlargement of all lymphoid tissue. In addition small haemorrhages often stud the outside and inside of the heart. Skin haemorrhages have been seen in the fetuses of pregnant ewes which die. Haemorrhages have also been seen in several other organs, such as the caecum, colon, gallbladder and kidney. Conjunctivitis and dried crusts around the nostrils are also often seen. The post-mortem signs, together with a history of movement of susceptible animals into a tick-infested area, should give rise to a presumptive diagnosis of Nairobi Sheep Disease. Confirmation requires the detection of virus or viral antigen or antibodies. The preferred specimens are blood in anti-coagulant or serum from febrile animals, mesenteric lymph nodes and spleen, forwarded to the laboratory on wet ice. Various laboratory tests are available to confirm the diagnosis. This includes Peste des Petit Ruminants, Rift Valley Fever, Heartwater, Salmonellosis, Parasitic Gastro-enteritis and Coccidiosis. In endemic areas infections with Nairobi Sheep Disease virus are silent and here infection does not warrant the application of control measures. However, sheep and goats imported into tick-infested areas should be vaccinated prophylactically before movement, or as soon as possible after they arrive. Attenuated and inactivated vaccines are available, the latter being the more effective. There is no specific treatment and any treatment is purely symptomatic, and supportive. Unaffected animals in a flock may be treated with acaricides to try to lessen infection by infected ticks. Peste des Petits Ruminants, otherwise known as Goat Plague or Pseudo-rinderpest, is an acute or subacute viral disease of goats and sheep characterized by fever, erosions and inflammation in the mouth, lips and tongue, gastroenteritis, pneumonia and death. Goats are primarily affected, sheep less so and cattle are only sub-clinically affected. Humans are not at risk. It can also infect a wide range of other domestic and nondomestic species although little is known about natural patterns of PPR in free-ranging African wildlife. This is a disease which occurs mainly in the Sahel region of Africa, that area to the south of the Sahara; and the Middle East, to which it was introduced via large importations of goats and sheep from Africa. A recent outbreak (2008) in north-west Kenya, entering via the Sudan, devastated many flocks of goats and sheep, which, not having encountered the disease before, suffered very high mortality. The disease was first identified in West Africa in the 1940s, PPR is now widespread across much of sub-Saharan Africa. High rates of death from PPR can have dramatic economic consequences, especially in rural African communities whose livelihoods rely on small ruminant livestock production. The virus of Peste des Petits Ruminants (PPR) is related to that of Rinderpest. Some nomadic goats and sheep in the West-African Sahel have a high innate resistance to PPR and usually undergo subacute reactions. In East Africa PPR is a killer disease with up to 100 % of goats and up to 50% of sheep dying from the infection! This is by close contact. Confinement favours outbreaks. Secretions and excretions from sick animals are the sources of infection. New infections are initiated when the virus is inhaled by in-contact goats or sheep. The virus enters the new host through the cells of the upper respiratory tract and the conjunctivae. Mortality in East African goats ranges from 77% to more than 90% and death usually occurs within a week of the onset of the disease. An incubation period of 2-6 days is followed, in the acute form, by a sudden rise in body temperature to 40-41.3 degrees C.
Affected animals appear ill and restless, have a dull coat, dry muzzle, congested mucous membranes and a depressed appetite. There is a clear nasal discharge which soon becomes filled with pus with an unpleasant smell. There may be sneezing. The discharge from the nose and eyes encrusts the nose and matts the eyelids. In more severe cases it may involve the dental pad, palate, cheeks and their papillae and the tongue. There is intense depression and diarrhoea may be very heavy. There is dehydration, hypothermia, followed by death, usually after 5 -10 days. Bronchopneumonia with coughing often develops in the latter stages of the disease. The disease is less severe in sheep and sub-acute reactions are more common than in goats, manifested by nasal catarrh, low grade fever, recurring crops of mucosal erosions and intermittent diarrhoea. Most recover after a course of 10 - 14 days. PPR may affect the immune system of the animals so that more complications arise. The most common activated complication is Pasteurella pneumonia, but other latent infections may also be activated. Orf lesions of the lip, for example, commonly develop in surviving goats. The following signs in goats and sheep point the way towards a diagnosis. Confirmation requires laboratory analysis of blood (also lymph nodes and tonsils). The carcase is dehydrated and soiled with foetid, fluid faeces. Muco-purulent discharges encrust the nose and eyes. Necrotic lesions are seen inside the lower lip and on the adjacent gum, the inside of the cheeks and on the lower surface of the tongue. The erosions are shallow, with a red, raw base, which later becomes a pinkish white with a sharp edge. Differential diagnosis includes Heartwater, Contagious Caprine Pleuropneumonia, and Nairobi Sheep Disease. There is no specific treatment, which must therefore be symptomatic and supportive. The veterinary authorities must be notified at once of any symptoms in goats and sheep suggestive of PPR. Immediate control by restriction of movement of susceptible animals and vaccination is essential, using PPR vaccine. Sick animals should be immediately isolated and contact animals vaccinated. In the event of an outbreak regulation of markets and movement is vital in the mechanics of control. May 2013: Review by Dr Mario Younan (DVM, PhD), Regional Technical Advisor for VSF-Germany, working in East Africa since 1995.